At the New Orleans Investment Conference this past weekend, I had a chat with Scott Melbye. Who’s he? Scott is an insider’s insider on uranium. And he and I chatted about the veritable conga line of bullish forces poised to drive the metal higher. 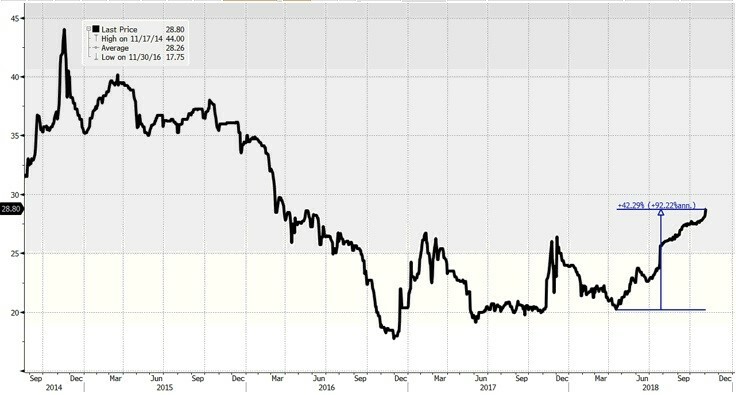 Indeed, uranium is already on a tear, up more than 42% from its lows this year, as you can see on this chart. But as this chart also shows, uranium is breaking out — rising above highs it made last year. It could go much higher. To tell you a little more about Scott Melbye: He is executive vice president for Uranium Energy Corp. (NYSE: UEC). He came to that position as a multidecade veteran of the nuclear energy industry. He worked for Uranium One and Cameco, and even served as president of Cameco’s uranium trading arm. Scott was also the chair of the Board of Governors of the World Nuclear Fuel Market (WNFM), and president of the Uranium Producers of America (UPA). He also served as VP-Commercial for Uranium Participation Corp., a fund that holds physical uranium. And he was an adviser to the CEO of Kazatomprom, the world’s largest uranium producer in Kazakhstan. So, he has some strong opinions about Kazatomprom’s upcoming IPO and what that means for uranium prices. And he has a good grasp of the other powerful forces lining up to push uranium prices higher. You can watch my video interview with Scott here: https://youtu.be/6HcYxGkS1CY. And stay tuned for more videos with other fascinating companies that I filmed while I was at the New Orleans Investment Conference. Not only videos, please. We elderly people need also transcripts. You must know about UEX-a Uranium Exploration company with 86 million lbs 43-101 compliant U308. That number is going to grow once their Maiden Christie Lake 43-101 is going to be announced. It also has a very significant High Grade, Open Pit Amenable, Uranium Free Cobalt discovery in the Athabaska Basin and is poised to spin out their 100% owned subsidiary as CoEX. How much better can things be? This stock needs a push from someone like you. Any thoughts? Hi Destinator! Thanks for your comment. We will never “push” a stock; however, our team of research analysts will certainly recommend stocks that promise a healthy balance of profit potential and relatively low risk. I can tell you that Sean is using his (small amount of) spare time this month to deep-dive into uranium stocks. So while I can’t promise he’ll cover UEX, I can say with a lot of certainty that you’ll be hearing a LOT more from him about uranium in the next couple of months!